The S&P 500 hit an all-time high of 2,130 last week. The large cap index had broken out of a consolidation period and surged to a 4% gain for the year. But the breakout hasn’t held up. In fact, US stocks were hit with the biggest selloff in weeks on Tuesday as the markets re-opened after the holiday weekend. This is known as a head fake. A head fake is simply a bullish technical pattern (like breakout to a new high) that doesn’t hold up. Instead of the bullish follow-through we typically see after a breakout, the market reverses course and gives a bearish signal. Needless to say, this type of volatile price action catches many investors off guard. 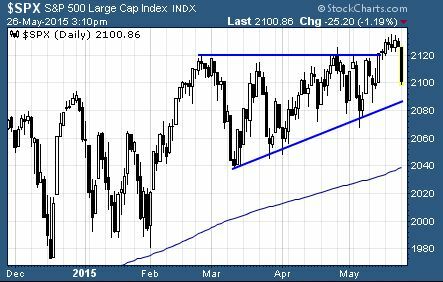 Despite the recent price action, I believe the S&P 500 will make a big move higher before the end of the year. Here are a few things you need to pay attention to when selecting ETFs to own in the 2nd half of 2015. Right now, much of the market volatility is being caused by interest rate expectations. Investors want interest rates low. The low rates and cheap money have made it easy for large companies to boost earnings through buybacks, mergers and acquisitions, and cost cutting. Even if the Fed begins to raise interest rates this year, they’ll still be extremely low. In fact, interest rates will still be ridiculously low for years even if they start raising interest rates this year. It’s created a situation where we see stocks sell off on good economic news because that means the Fed could raise interest rates sooner than expected. This is completely backwards for investors. The reality is that the stock market tends to perform better during the time the Fed begins to hike interest rates. So, either completely ignore market volatility due to interest rate speculation or use the selloff as a buying opportunity. Another thing to keep an eye on for buy signals is investor sentiment. More often than not, investor sentiment is a great contrarian indicator. In other words, be bullish when others are bearish and be cautious when everyone else is bullish. The latest reading from the AAII Investor Sentiment Survey shows that only 25.2% of investors are bullish on stocks right now. That’s well below the long term average of 38.9% of investors that are usually bullish. As a contrarian that believes most people are wrong most of the time, this is a bullish indicator. We’ve seen it time and time again… the investors that aren’t bullish on stocks will pile into stocks once the markets begin moving higher. This influx of money will help propel the markets higher during the 2nd half of 2015. Which ETFs Should You Own For The Second Half Of 2015?